You probably recognize mouthguards from contact sports like hockey or boxing, protecting an athlete’s teeth from damage during high impact activities. But they aren’t just for sports – mouthguards can also prevent damage to the teeth, reducing the need for restorative dentistry treatments to improve the health of the teeth. 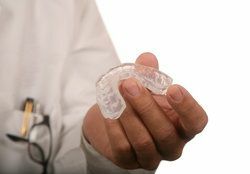 At Smile Solutions by Emmi Dental Associates, we have prescribed custom fit mouthguards for our Wilmington patients to help solve significant dental issues. Why Would I Use a Mouthguard? There are two critical dental issues in particular that are often treated with the use of a mouthguard. If a patient’s bruxism is caused by episodic anxiety or stress, it may be treated with rounds of therapy and education on relaxation and stress relief techniques. But this may not solve the problem overnight, and for many patients there is no clear underlying cause. In this case, your dentist must treat the symptoms – and this often includes the fitting of a custom mouthguard. A mouthguard keeps your upper teeth and lower teeth separated by thick custom-molded plastic, protecting them from clenching and grinding against each other and causing damage. If you are living with bruxism, a night guard can be a very useful tool to help preserve the health and aesthetics of your teeth. No matter what the underlying cause of a TMJ disorder is, in many cases it can be helped by the use of a mouthguard. Even for TMJ disorders that are not directly caused by bruxism, tensing or clenching of the jaw can worsen symptoms – mouthguards, on the other hand, can help prevent this reflex and alleviate symptoms. If you are suffering from the aches and pains associated with chronic teeth grinding or TMJ disorder, a custom night mouthguard could help. At Smile Solutions by Emmi Dental Associates, we are dedicated to finding the best solution for a healthier smile. Contact our dental office to schedule an appointment and learn more about how mouthguards can benefit you today.